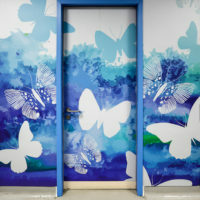 CS Acrovyn by Design has been applied to doors with stunning results at local Perth nursing home, Koh-I-Noor creating an uplifting feel for patients. CS provided 40 bespoke printed Acrovyn by Design Wall Protection panels to St. Vincent's Private Hospital featuring local Toowoomba flora and nature scenes. CS Acrovyn HRWS6C was installed throughout the communal areas of the building, chosen for it’s non-institutional aesthetic & high quality finish. 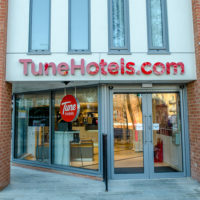 The laminate guest room doors at the Hotel showed signs of damage. To protect the doors & extend their lifecycle they turned to CS Acrovyn Door Protection. To ensure the hospital’s corridor walls could withstand constant use by 30,000+ patients a day, the hospital chose Hospital Grade Wall Protection from CS. Due to the regular movement of beds, patients and heavy equipment within the ward, Bristol Royal Infirmary were experiencing extensive wall damage. Discover how a recent refurbishment of the Birmingham Children's Hospital general surgical ward has transformed the environment for both patients and staff. 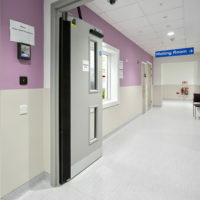 Discover the highly durable and easy to maintain hospital fire doors chosen to protect Perth Royal Infirmary. 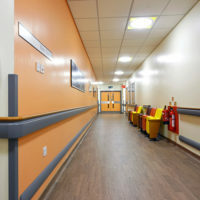 Discover the hospital wall protection package that has transformed the Royal Oldham A&E department, reducing maintenance costs and increasing aesthetic appeal. 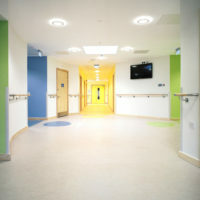 Discover how St. Helier Hospital are reducing fire door maintenance costs & extending both door and building lifecycle.